An entree of freshly cooked Caribou Tenderloin on a special gourmet sauce which has been cooked to perfection by a gourmet chef. Food preparation for this mouth watering entree of Caribou Tenderloin takes some time and practice to ensure its perfection. A gourmet chef at the Rifflin'Hitch Lodge in Southern Labrador has prepared this meal numerous times for the guests. This entree of Caribou Tenderloin has been cooked so the outer edges of the meat are nicely browned while the inner is still fairly red. Served on top of a special sauce created by the gourmet chef, this entree is hard to resist. 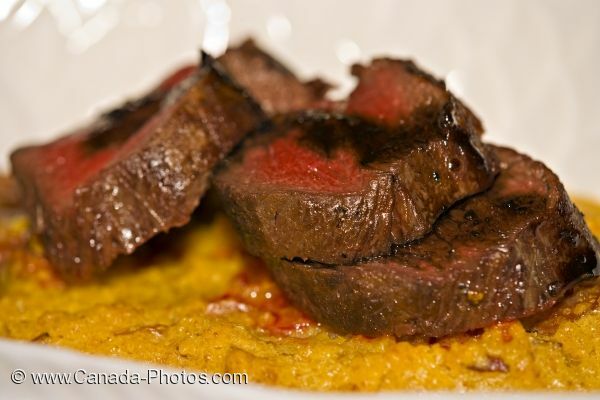 Caribou Tenderloin - Entree by Chef Nancy Elliot, Rifflin'Hitch Lodge, Eagle River, Southern Labrador, Labrador, Newfoundland Labrador, Canada. Picture of a delicious looking meal of Caribou Tenderloin accompanied by a special sauce served as a main entree.